The aim of this study was to examine brain activity associated with impaired decision-making in hoarding disorder. A total of 107 adults (43 people with hoarding disorder, 31 with obsessive-compulsive disorder, and 33 healthy control participants) underwent functional magnetic resonance imaging (fMRI) while making decisions about whether to keep or discard items that they had brought from home to the experiment, as well as decisions about whether to keep or discard comparable items that did not belong to them. Compared to the other two groups of participants, people with hoarding disorder exhibited abnormal activity in the anterior cingulate cortex and insula. When deciding about items that did not belong to them, patients with hoarding disorder showed relatively lower activity in these brain regions. However, when deciding about items that belonged to them, these regions showed excessive fMRI signals compared. These differences in neural function correlated significantly with hoarding severity and self-ratings of indecisiveness and “not just right” feelings among patients with hoarding disorder. These results suggest that hoarding is characterized by poor regulation of the anterior cingulate cortex and insula, regions that are involved with identifying the emotional significance of a stimulus, generating appropriate emotional responses, and regulating emotional state during decision-making. This study investigated the use of a program of stepped care, in which patients are first given a low-intensity, low-cost treatment and the more costly intervention is reserved for those who do not respond to the first intervention. Thirty adults with obsessive-compulsive disorder (OCD) were randomly assigned to receive stepped care exposure and response prevention (ERP) or standard ERP. Those receiving stepped care started with three sessions over 6 weeks of low-intensity counseling with an ERP self-help workbook; patients failing to meet strict responder criteria after 6 weeks were given the more traditional treatment of therapist-administered ERP (17 sessions twice weekly). Those receiving standard ERP received the therapist-administered ERP with no lower-intensity lead-in. 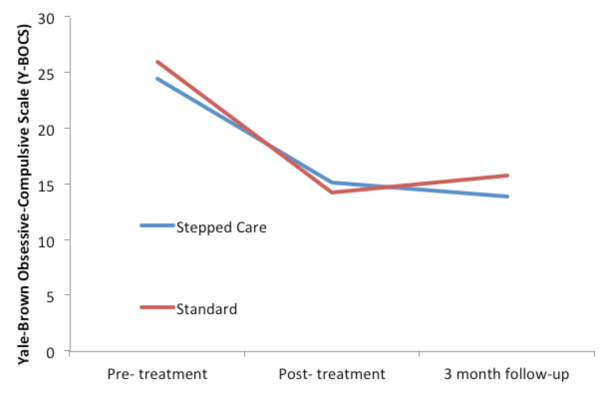 Results showed that stepped care and standard ERP were equally effective, with 67% of stepped care completers and 50% of standard treatment completers meeting criteria for clinically significant change at posttreatment. Examination of treatment costs revealed that stepped care resulted in significantly lower costs to patients and third-party payers than did standard ERP. These results suggest that stepped care ERP can significantly reduce treatment costs, without evidence of diminished treatment efficacy or patient satisfaction. Tolin, D. F., Diefenbach, G. J., & Gilliam, C. M. (2011). Stepped care versus standard cognitive-behavioral therapy for obsessive-compulsive disorder: A preliminary study of efficacy and costs. Depression and Anxiety, 28, 314-323. If you would like to be contacted for future study opportunities, join our research registry.